Petite Opera Productions, a 501c3 non-profit professional company, is currently inviting artists to audition for its exciting new November 2019 production The Falling and The Rising. Classically-trained adult artists (ages 18+) are invited to send in their materials for consideration. All auditions will be held in Park Ridge, Illinois (a Chicago northwestern suburb), by appointment only. Casting preference is given to Chicago-area* local adults and teens. Candidates should have strong, trained voices that can perform in a classical style, with excellent English diction, good stage presence, excellent acting/character creation and movement, and ability to learn music quickly. Please enter “AUDITIONS 2019” on the subject line. Note: For the 2019 production, if you have submitted materials on or after December 2018, you need not submit again to be considered. If selected to audition, you will be notified via email. 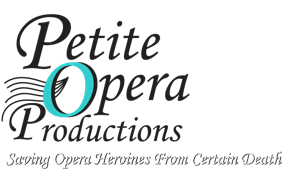 Petite Opera Productions is a professional company that produces professional-quality opera, operetta, spooferetta and musical theatre. The company specializes in works in English appropriate to introduce new patrons to acoustical live stage productions. The company casts complete performers—classically-trained vocalists who create deep characterizations and dance/move well—and volunteer chorus, orchestra and dancers from the community. Each production runs for 6 or more performances in an intimate, acoustic-friendly space. The company takes a cross-over approach to all genre performed. *Please note that Petite Opera does not provide housing, transportation, or transportation reimbursement for performers. Performers must be local Chicago-area candidates or those that can provide their own housing and transportation (to the northwestern suburb of Park Ridge) for the rehearsal period, which occurs up to three days per week and is spread out over a 12-14 week period (due to venue access).